Wrinkle is a fold or a crease in the skin appear generally as a result of aging processes. Wrinkles result from an accumulation of various types of damage. When we are young, as our the skin has a great capacity of stretching and holding in moisture, we won’t have wrinkles. However, over time, it loses this ability and succumbs to external and internal factors, to show the damages on the skin. The dermis has an elastic quality due to its elastin fibers and has a protein called collagen which keeps the skin tight and helps in preventing wrinkles. Wrinkles and Sagging affect in all the layers of the skin . As we age, the epidermis loses its ability to shed off the dead cell layer from the surface naturally. It leads to accumulation of destructed and pigmented cells on the skin. So it loses its power to hold on to moisture, which leads to dryness, and eventually fine lines appear on the skin’s surface. Deeper in the skin, in dermis, collagen and elastin break down, decline both in quantity and quality, which weakens the skin’s support structure. The skin becomes thinner in nature, and is easily affected by external and internal derangements. During this time itself, fat and oil glands also start to disappear from the skin’s deepest layers(hypodermis), which leads to shrinkage and sagging of the layer. Together, these effects create prominent lines, deeper wrinkles and furrows. There is no particular or specific age that everyone is suddenly starting to show wrinkles. This will be mostly dependant on the nature of skin care and lifestyle provided. Age- As age progresses , the natural collagen along with keratinocytes, which help to support the structure, shape and fullness of the skin, decreases and skin cells lose the ability to retain texture, tightness, moisture and tone. 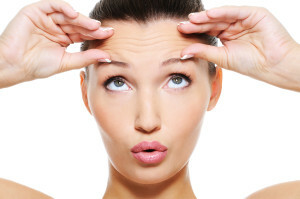 Over a period lines and wrinkles appear on the skin. Sun- The sun effect is the most important factor in skin wrinkles. UVA rays affect the deeper layers and UVB rays affect the outer layers, badly damaging the collagen fibers, causing their abnormal accumulation. This results in production of large amounts of enzymes called metalloproteinases which breakdown collagen at a higher rate than with just chronologic aging. This forms disorganized collagen scars, eventually leading to wrinkles. Smoking- The smoking increases Free radicals in the body, which cause wrinkles by activating the metalloproteinase. This damages the skin’s collagen and leads to depletion of vitamin C which is needed for new collagen formation. Nicotine reduces blood flow to the skin, results in less oxygen supply to it. Skin becomes sallow and the quantity and quality of cell production decline, leading to dry, damaged skin, that is less resistant to external and internal stresses. Hormone Effects – It is naturally seen that there are skin changes as a result of the hormonal effects of menopause or decreased estrogen production. SIRI Care for Wrinkle and Face Lines correction. SIRI, is a non-invasive skin treatment, which is the fruitful outcome of combination of cosmetic and medical science, for the rejuvenation and renewal of skin. It will help in improving the glow and brightness of the skin and in reducing wrinkles and pigmentation. The treatment with serum acts mainly in two steps, like exfoliating phase and Rejuvenating face. The Serum used in the first phase of treatment contains Carbomers , Epidermal Lysing Factors, Stem cells enriched with growth factors, Epidermal Growth Factors, Aqua distillata etc. exfoliate and stimulate the damaged topmost layer, paving way for the active lower layer cells to regenerate. The serum used in the second phase contains more rejuvenating fragments. They are Stem Cells, Skin Matrix TM, Wonder Light TM, which stimulate the collagen and elastin fibers, to multiply more, to refill the furrows and wrinkle with newly formed healthy cells. This will help the skin to regain its declining tonicity and integrity. The endothelial growth factors will activate production of more blood vessels so that the newly forming cells will get more oxygen and nutrition. Epithelial growth factors will stimulate the epidermal stem cells to multiply more to fill the deep lines appeared on the skin surface. This can be used for the improvement of the wrinkles on back, hands, neck or any other part of the body also. Repeated treatments, over time will peel away the damaged top layer and renew the lower layer with more fresh cells. This will give effective result in texture and wrinkle correction.